Anthony "Buck" Rogers is a fictional character who first appeared in 1928 as Anthony Rogers, the hero of two novellas by Philip Francis Nowlan published in the magazine Amazing Stories. Rogers is best known from the long-running syndicated newspaper comic strip. He also appeared in a movie serial, a television series (where his first name was changed from Anthony to William) as well as many other formats. The adventures of Buck Rogers comic strips, movies, radio and television became an important part of American pop culture. This pop phenomenon paralleled the development of space technology in the 20th Century and introduced Americans to outer space as a familiar environment for swashbuckling adventure. 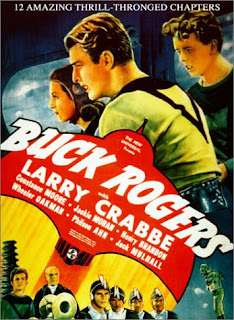 Buck Rogers has been credited with bringing into popular media the concept of space exploration, following in the footsteps of literary pioneers such as Jules Verne, H.G. Wells and Edgar Rice Burroughs (John Carter of Mars). In 1932, the Buck Rogers radio program, notable as the first science fiction show on radio, hit the airwaves. It was broadcast four times a week for 15 years, from 1932 through 1947. The radio series was produced and directed by Carlo De Angelo and later by Jack Johnstone. In 1988, Johnstone recalled how he worked with the sound effects of Ora Nichols to produce the sound of the rockets by using an air-conditioning vent.